Keeping things fresh by changing the process for this one. Colour is one of my favourite subjects and I saw a technique by Jeff Watts where he'd first lay down 'abstract notes of colour" - ie anything he feels like. I guess it harks back to Harley Brown's book where he talks about making sure you aren't timid about your painting from the get-go. Mucking up the painting up from the start did relax me, I must admit, but since it was on the iPad there was always a thought in the back of my mind that I could undo this. So...not as brave as I could have been. The video of the process is below. I firstly did a sketch before a 2 hour live model session and scanned it in, Placed it on a layer, and went ahead. 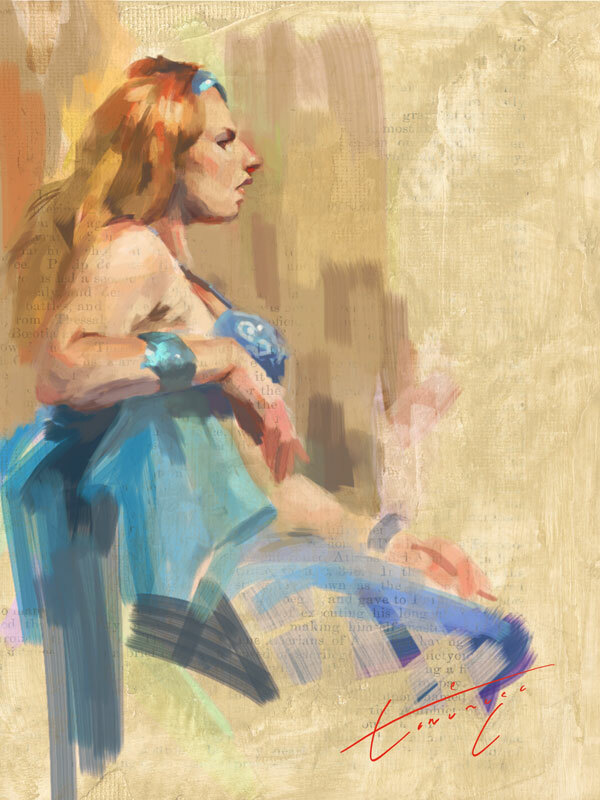 Done with the Brushes App.